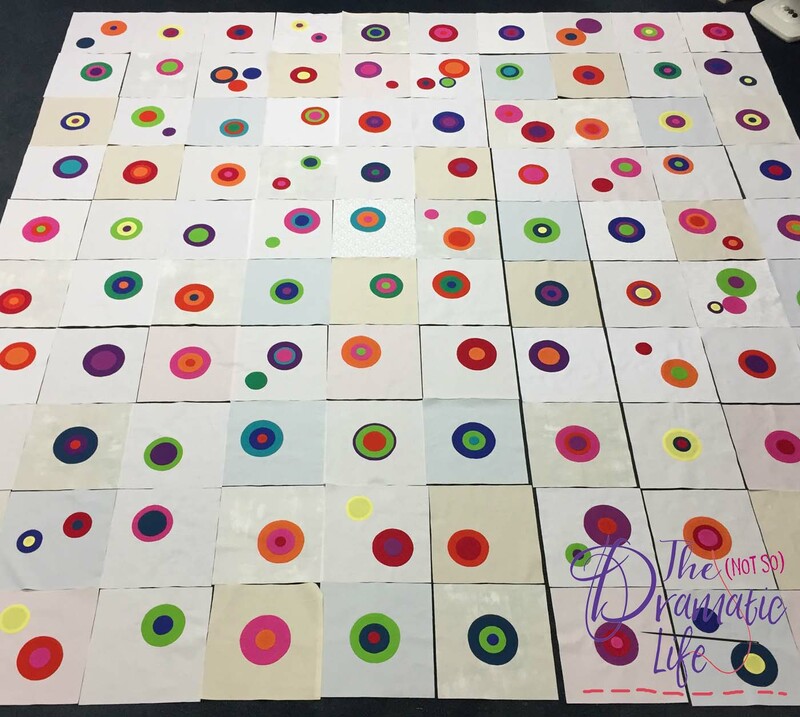 My 100 Day Quilt project was a success, and I want to thank everyone who followed the progress on Instagram! Resonance is the ultimate result. 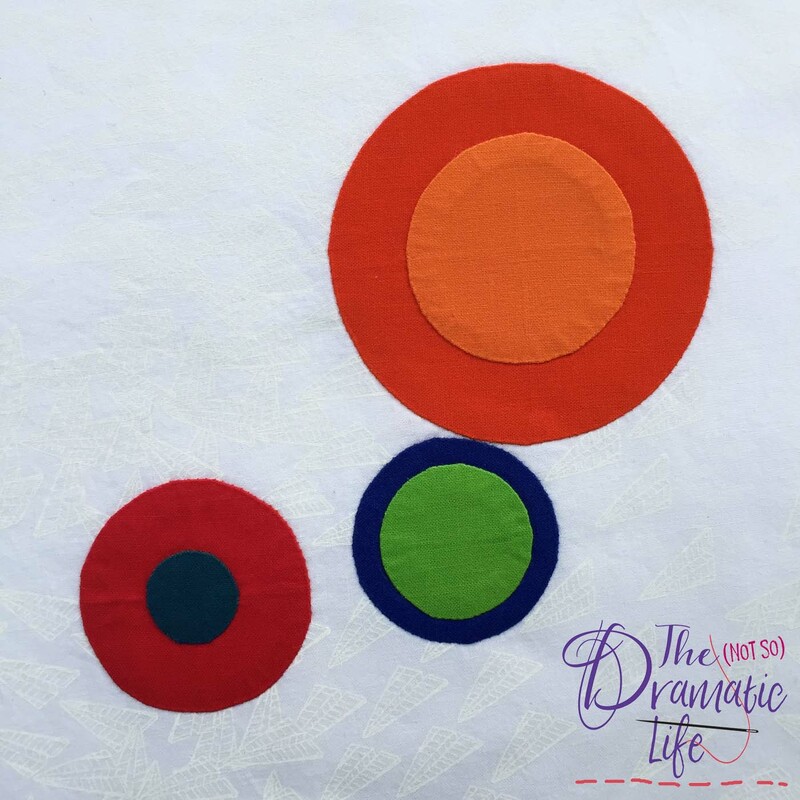 It was named in reference to the quilting stitches which echo out from a central point. If you would like to know more about the start of the project, check out the first post about the 100 Day Circle Quilt Project. The next two days were spent trimming the blocks to their finished size. Laying the quilt out was a bit tricky. Since it was too large for my design wall, I cleared out the kitchen and arranged the blocks on the floor. This photo was taken with my phone touching the ceiling, and I still couldn’t get far enough away to capture the entire quilt design. After a couple more days, the quilt top was finished. 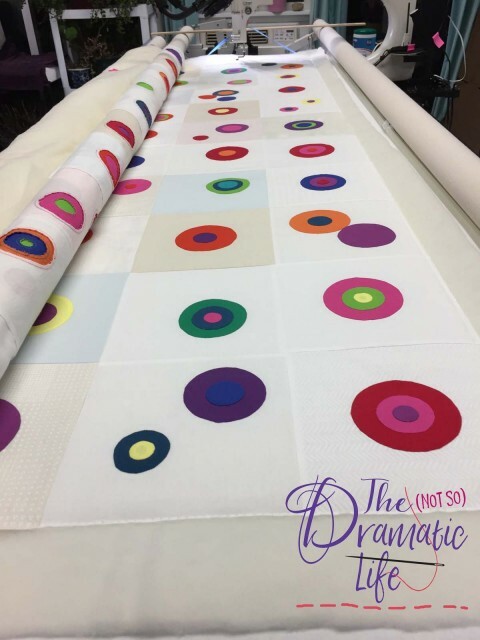 There were 13 different colors of thread used to quilt the project. 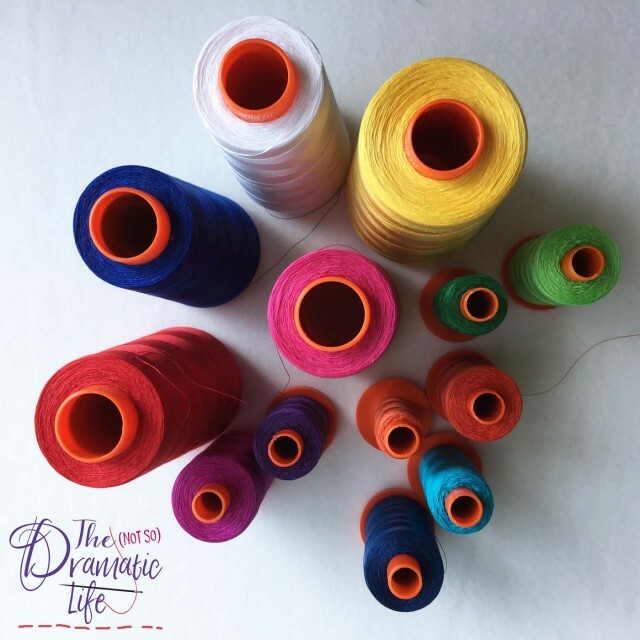 A different thread was used for each fabric. 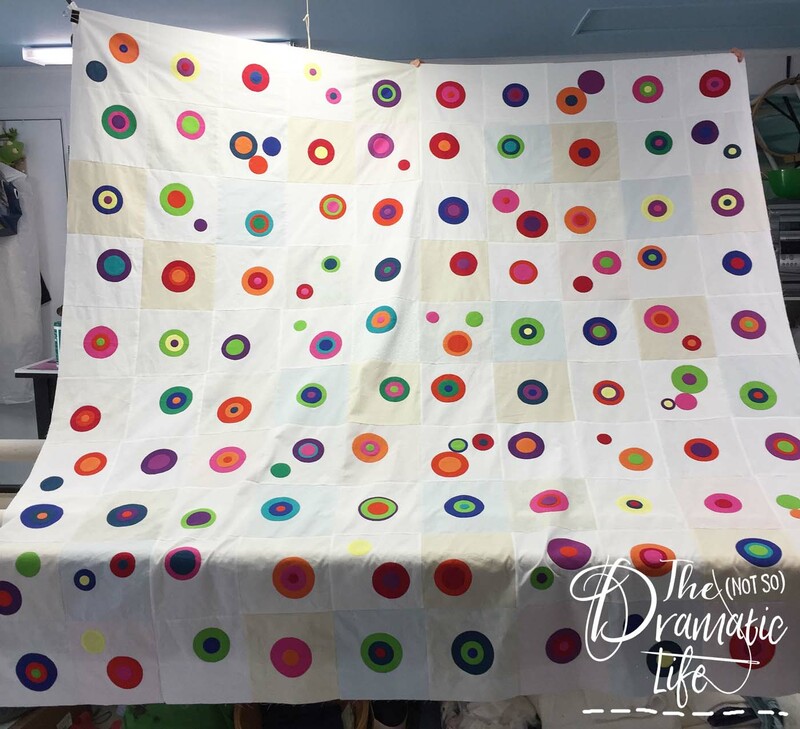 This extended the color beyond the edge of each circle, and ensured that the back, as well as the front of the quilt, would show each color change. I knew that I would want lots of lines of stitching around each circle, so I decided to use 50wt thread so I could do lots of stitching without excessive thread build up. Here is the quilt loaded and basted on the longarm. 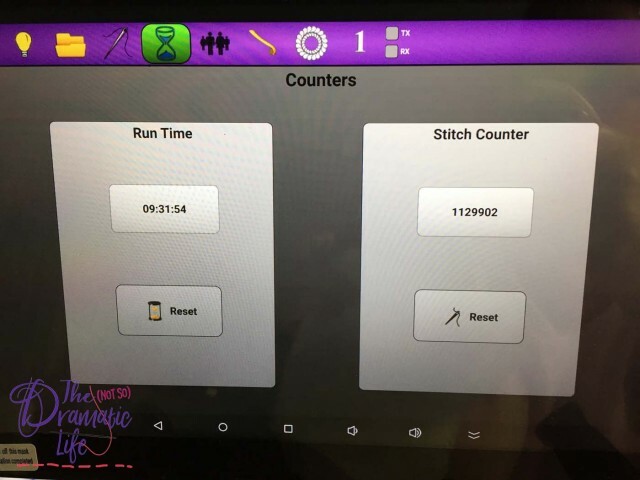 The quilting process took quite a long time. 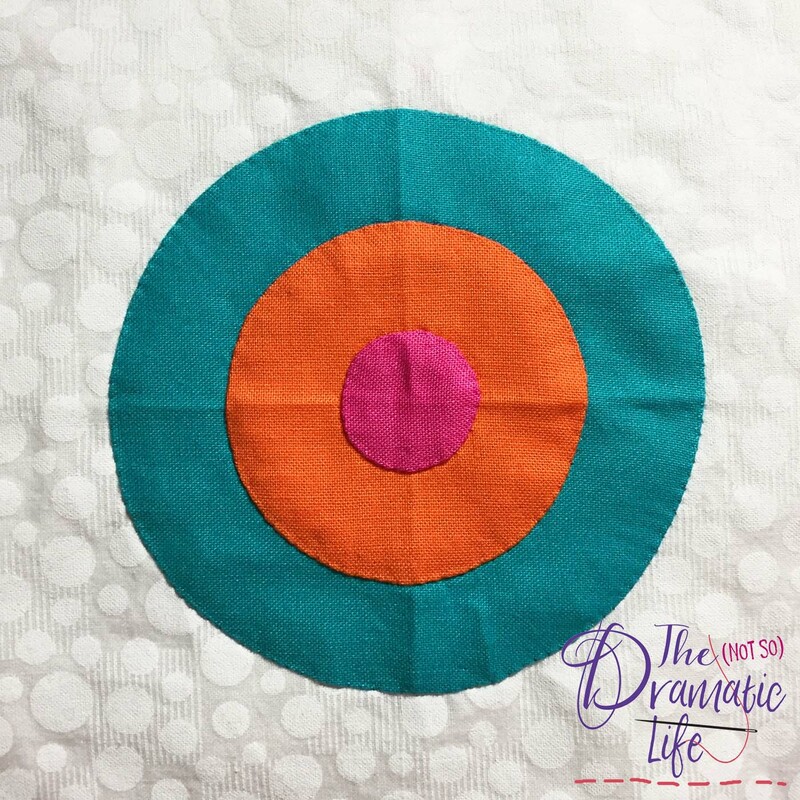 I quilted each circle from the inside out to prevent bunching in the fabric, so there were a lot of thread changes. 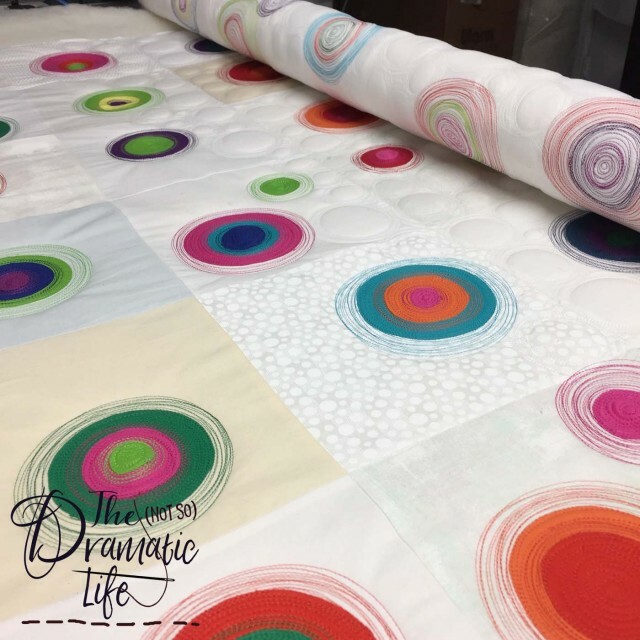 Once the circles were quilted, I did large scale bubble quilting in the background. There were more than a million quilting stitches in this project. I’m pretty sure that is a personal record! 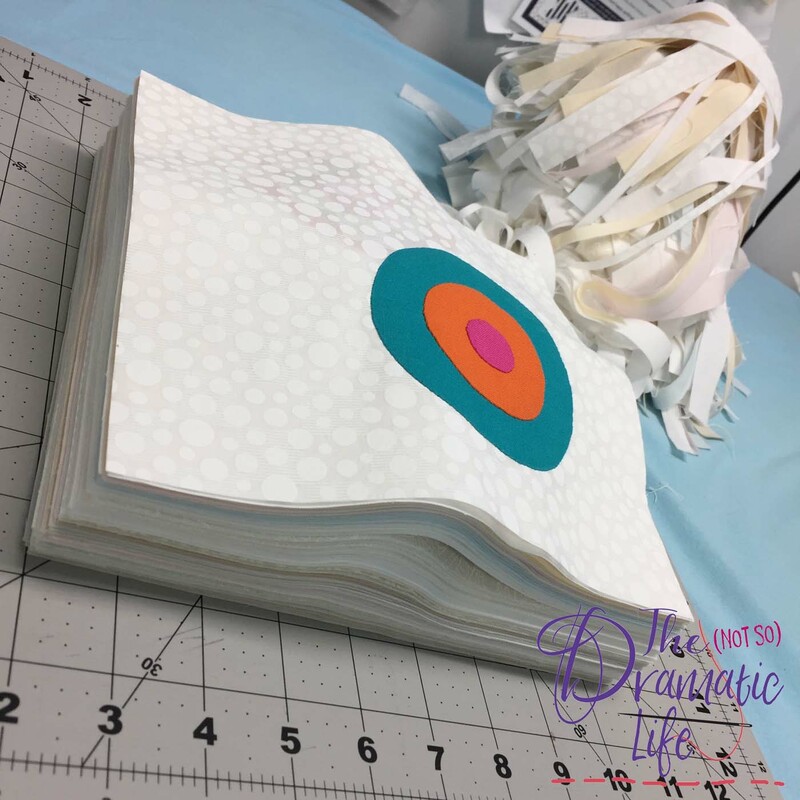 The binding is mostly white, with some sporadic shots of color. 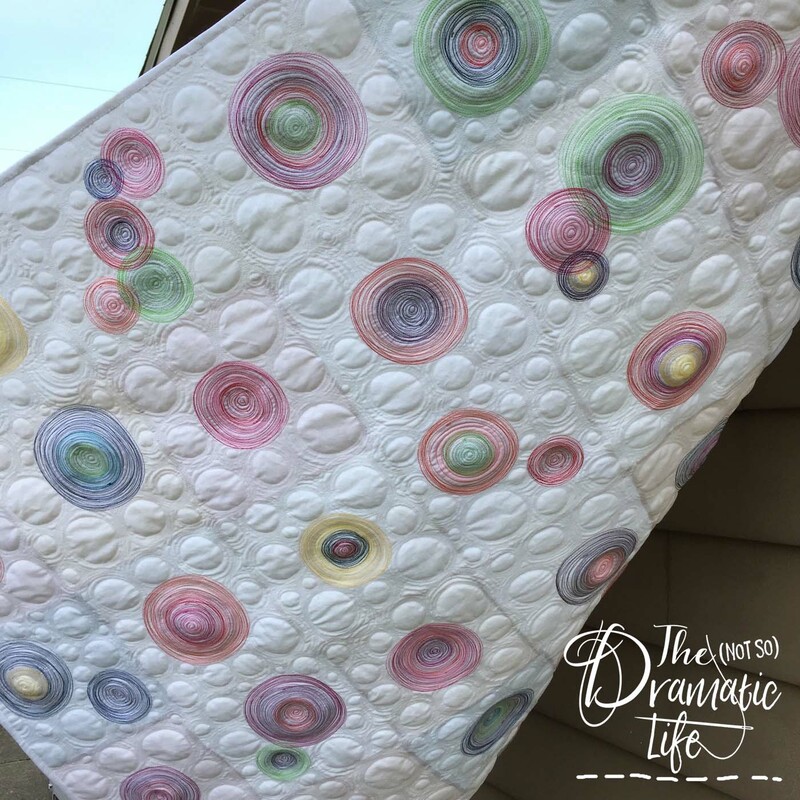 I love the way the back of the quilt looks! 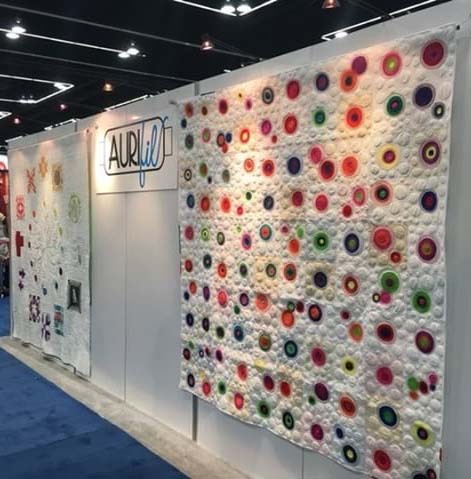 To cap it off, Aurifil asked to use this quilt in their booth at Spring Market this past weekend! This is my first quilt to be included at a Quilt Market, so I was very excited! 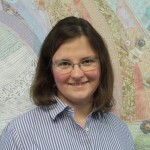 It’s a stunning quilt, Cassandra, and it was fun to follow your progress during the 100 days you worked on it. I love that you chose to change your thread color so much and how it reads on the back of the quilt. I am blown away. This is so amazing. All the colors, the thread changes, the stitching and the final look. Congratulations on the project from concept to completion. This is so very cool. 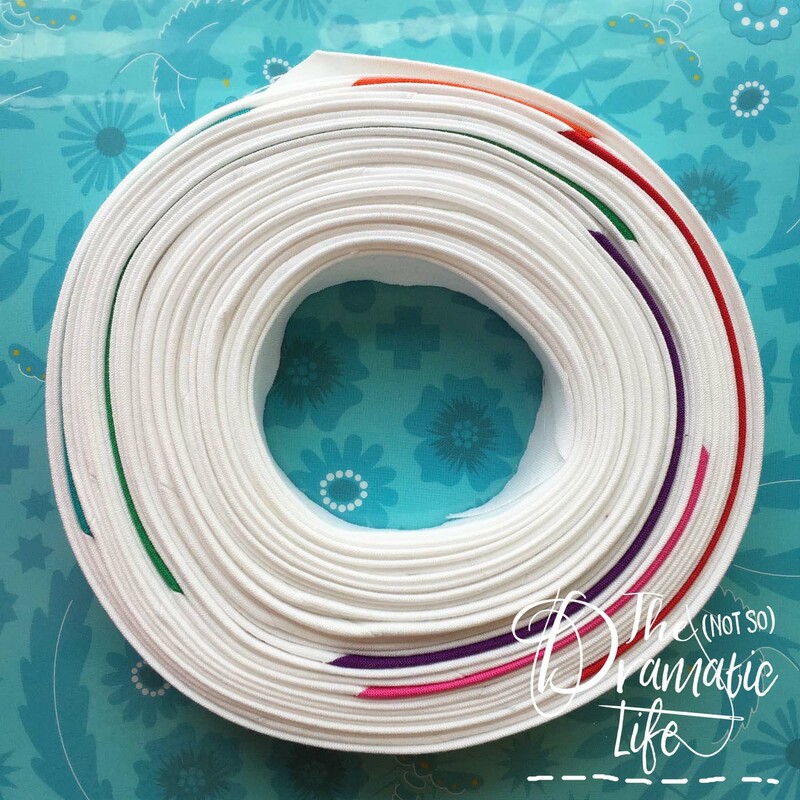 I can see why Aurifil sought it out for their booth. 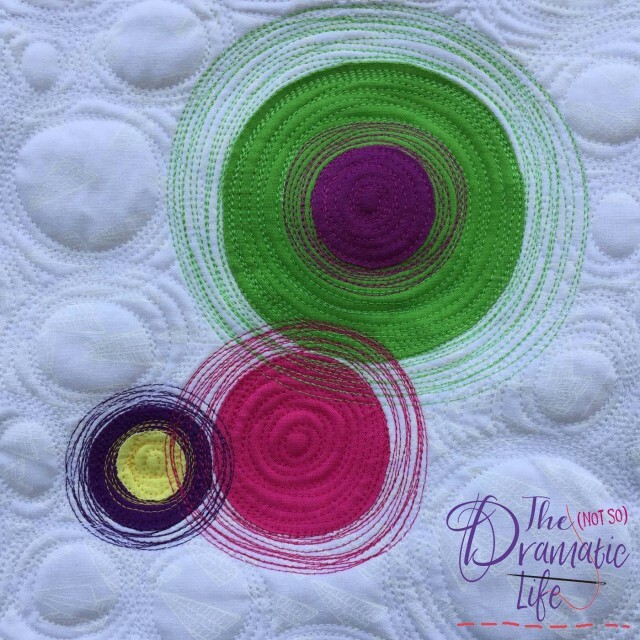 Amazing color and texture, use of thread and negative space, and what appears to be hand appliqué. Love your posts, love your work. Thanks for sharing your process. Wow! Just stunning. Too bad they couldn’t display it so that both sides were visible. The back is as beautiful as the front. Kudo’s Cassandra, you did a fantastic job. 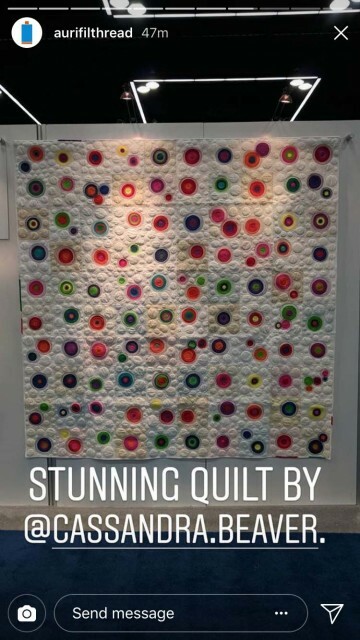 Thanks for showing this to beautiful quilt to everyone. Really stunning quilt. 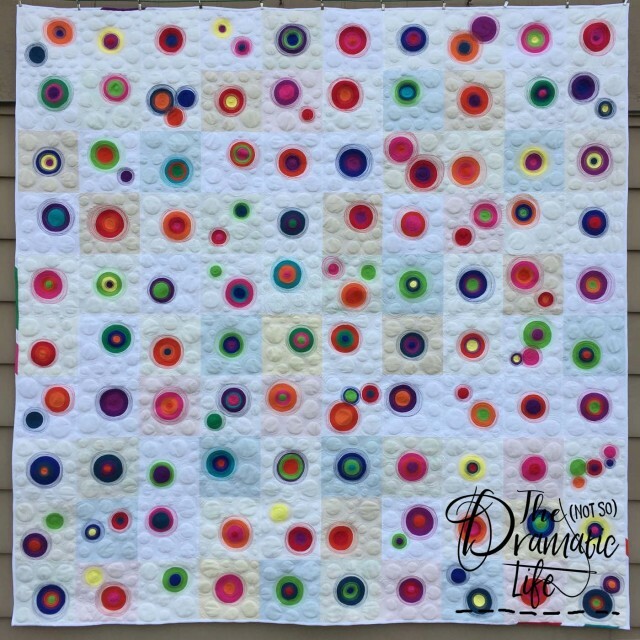 I enjoyed following along on IG and the finished project is just incredible – I especially love the effect of the thread colors blending the circles (plus the back is just as great as the front). Thanks for sharing your process with us! I saw this at Quilt Market and loved it. 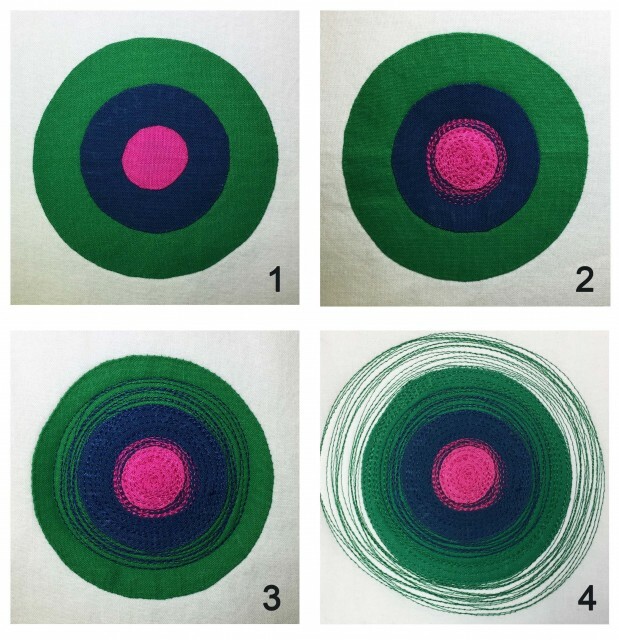 So nice to get to see your process in this post. Keep up the creative work. I love hoe the circles occupy space but not in the same location in each block. 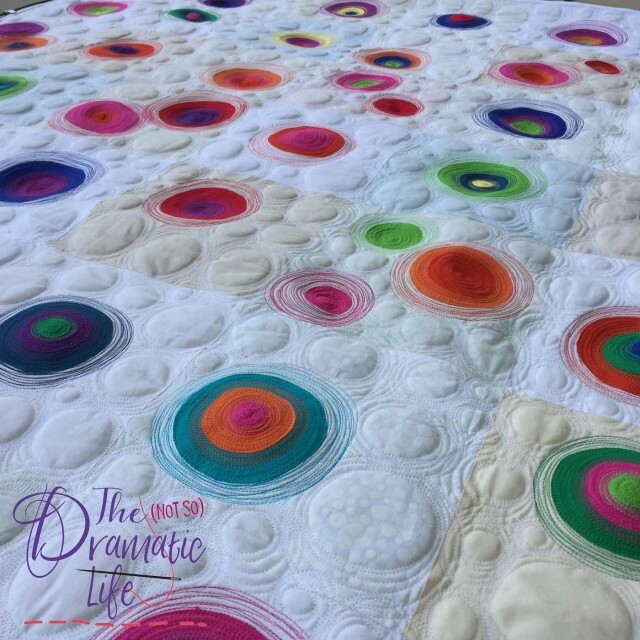 Dynamic quilting, too.